Everything You Need to Know About the Totally Southtowns Family Fall Festival!! It’s time to celebrate! It’s finally here!!! The Totally Southtowns Fall Festival will have it all – fun for the entire family! With food, bounce houses, shopping, live music and much more – the fest is sure to please everyone. 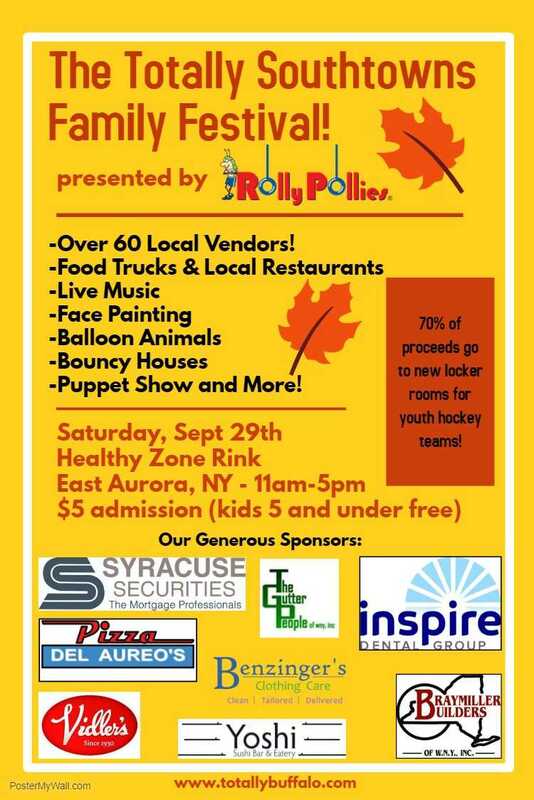 The event will be held at the Healthy Zone Ice Rink, 41 Riley Street, East Aurora. The venue is a totally covered, open-air arena that is perfect for any weather! It is a beautiful building in the heart of the Village of East Aurora. There is free parking. You can expect tons of fun! We will have two bounce houses for the kids, face painting and balloon animals all day long! There will be a puppet show put on by Mike Randall and Friends at 2 p.m. This is a favorite of children and adults!! Mike has been on the air at Channel 7 for decades and is a beloved member of the WNY community!!! We are so grateful to have him at the festival! The kids will also love to meet Buffalo’s Best Batman! He’s always up for taking pictures with the kids. Cinderella and Ariel, the Little Mermaid will also be on hand to take pictures with and talk to the kids between the hours of 11 a.m. and 1 p.m!! Yes, there will be a beer garden at the festival!! 🙂 Featuring selections from the Hamburg Brewery – a Southtowns original! We’ll also be serving hard seltzer and wine! Scott Celani trio– 3 p.m.
Brian Beaudry – 4 p.m.
Sam Marabella trio – 1 p.m. WHEN: September 29th from 11 a.m. to 5 p.m. COST: $5 (kids 5 & under are free) 70% of all money goes directly back to the rink to help build new youth locker rooms! BUY TICKETS HERE – or buy them at the door!